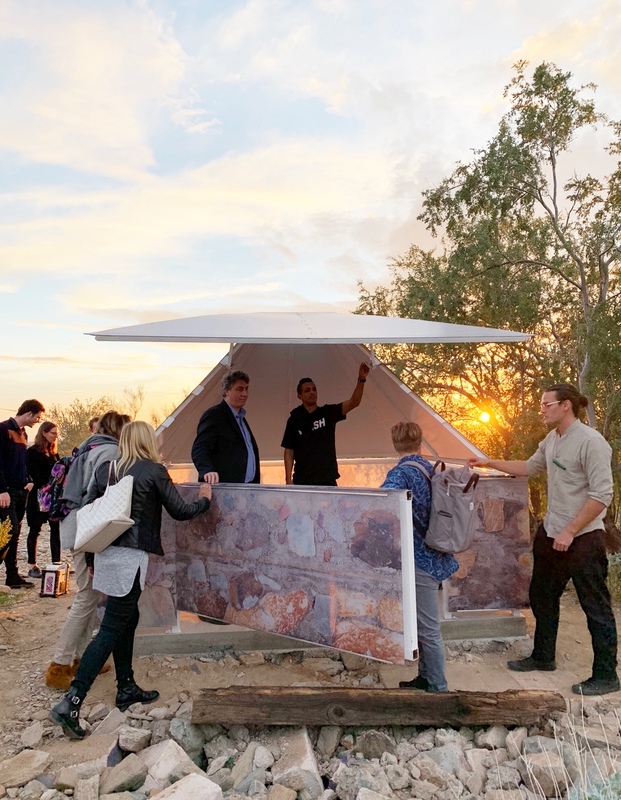 Alexander Josephson of Toronto architecture firm Partisans travels to Phoenix to experience Frank Lloyd Wright’s legacy first-hand – just as students at the recently rescued School of Architecture at Taliesin are presenting their visions for temporary desert shelters. I remember driving to Cornell University for an architecture school interview with my father. Like any student, I didn’t know what I didn’t know. Looking back, I think my parents were secretly concerned that I might actually get accepted. After all, the Canadian dream of going down south to study is an expensive one. But it is also a pilgrimage; there are certain institutions in the world of architecture that we all make time to go visit or try to get into. You can’t help but be drawn to them. That day in the winter of 2001 my interview couldn’t have gone worse. I told the professor sitting across from me, a white-haired man named Mr. White, or Mr. Grey, that I loved Frank Lloyd Wright and building things. Mr. White or Mr. Grey swiftly responded: “Young man, that’s great, but being an architect isn’t the same thing as being a builder.” And I don’t think he cared who my favourite architect was. I did not get into Cornell. It was only a few weeks later, before my interview for the University of Waterloo School of Architecture, that a mentor and friend of mine let me in on a little secret: at all costs, avoid citing Frank Lloyd Wright as your favourite architect if you want to be taken seriously. Luckily, by then, I had taken a real interest in Jean Nouvel. I got in. Anyone but Wright would have done. But why? I am about to be picked up from the Phoenix airport by Richard Quittenton, a promising soon-to-be architect and a former student of mine at the Daniels Faculty of Architecture at the University of Toronto. It’s December 2018 and the air in Phoenix is therapeutically warm and dry. The moment I got off the plane, I could actually breathe. I suddenly understand why everyone’s grandparents move here; they won’t catch a cold and it’s cheaper than Palm Beach. And as coincidence has it, Frank Lloyd Wright felt the same. He started moving there at the ripe age of 68, in 1935, to establish an outpost in the world of architecture that would eventually become legendary: Taliesin West. I find Quittenton waiting with a car at arrivals. Then another man, wearing a well-tailored Japanese suit, strolls up to greet me with a big smile and a resounding hello. Aaron Betsky is one of the great minds in contemporary architectural theory and criticism and the Dean of the Frank Lloyd Wright School of Architecture at Taliesin. Quittenton has been clever enough to schedule our arrivals simultaneously. I ride shotgun as the author of At Home in Sprawl gives me a front row–seat tour through a prototypical city of sprawl. On and on it goes, an essay in post-war American suburbia rendered in adobe browns, beiges and burnt umbers. Then, at a nondescript intersection, the gates to Taliesin emerge. The gates and campus all speak to a moment in time. Frank Lloyd Wright and his pupils built this place with their bare hands and rudimentary mechanical equipment. The structures are all defined by a sense of craft and matter. Local stone was quarried to be mixed with concrete as the base move across all of the buildings. Which only makes sense ­– in the desert, structures need to have thick walls and provide shade; they need to retain heat during the day and release it through the night. 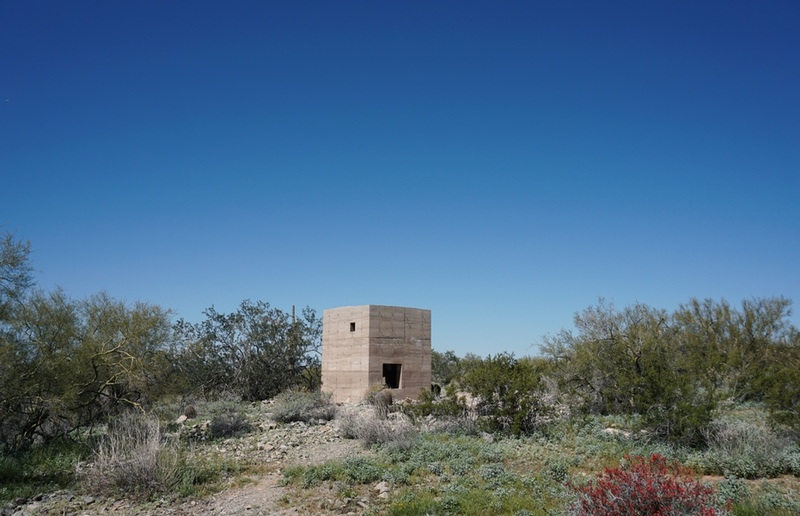 Still in the car, we drive past all these buildings that clearly evoke a Wrightian stance on desert architecture – horizontal and prairie-inspired, they are punctuated by windows, portals, trellises and heavy stone-concrete bases. We park, and Quittenton and Betsky usher me to the compound. As we descend a small but wonderfully crafted pathway – past a pool inset behind a low wall, and then a small reflecting pond the shape of a crystal – the experience of the site as a kind of temple strikes me. At the central breezeway, two structures frame an elevated view of Scottsdale and Phoenix at dusk; the city beyond is aglow with lights and the pink hue of the sky. 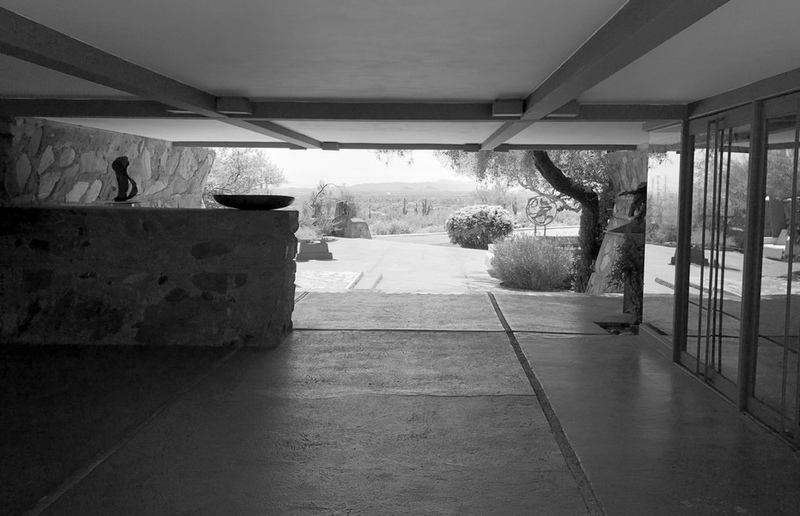 The ceiling of the breezeway is low and the textures of the stone boulders, embedded in cement, are intensely willful. Only truly exceptional architecture creates that effect. To the right, a red, smooth pivot wall leads into a space six-foot-six-inches tall by 20-feet wide and about 30-feet long. I can effortlessly reach up and touch the ceiling’s adobe-painted steel rafters, which resemble wooden beams, and their white coffer inset panels. With its cantilevered corner glass windows and six 10-person dining tables with matching chairs upholstered in bright blue fabric, this space has been kept mostly in its original state, dating back to the first days of Taliesin. Students eat their lunch while making casual banter as my hosts lead me into the kitchen, where another panel pivot door opens. And suddenly I am in it – the space that, to me, most embodies Taliesin: the studio, with its exposed deep-section, angled wooden rafters with canvas inlays. Wright’s understanding of the human scale through the articulation of his spaces is unparalleled. There is an intimacy that I realize is missing from a lot of my own projects. There is a tactility and proximity of surfaces, materials, and forms that most contemporary architecture ignores due to a desire for creating images or volumes. Frank Lloyd Wright’s architecture cannot be captured in a photograph; no image of Taliesin can do it justice. My mind was instantly changed upon experiencing it. Revered for his contributions to the field of architecture, Aaron Betsky is part of the group that saved the Frank Lloyd Wright School of Architecture, housed at Taliesin. 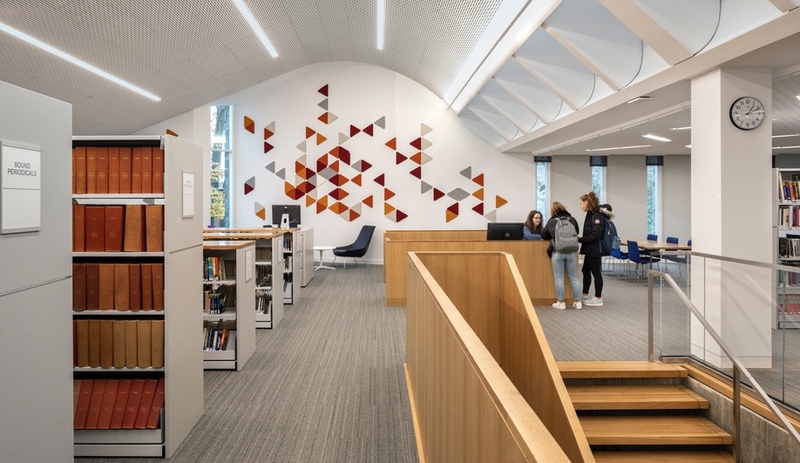 He has not only helped raise a considerable amount of new financial support for its revival but has also breathed new life into the school by reinventing its curriculum and inviting other architects from around the world to teach there. I went as a guest for reviews, but upon leaving felt I had to write about the experience; I had questions and knew that others did too. Why had Frank Lloyd Wright fallen out of favour in academic architecture circles over the decades? And why did one of today’s biggest minds in architecture decide to move to the middle of the desert to save his school? How did two promising Canadian master’s students wind up there doing some of the most interesting work I have seen at a school anywhere in the world? Frank Lloyd Wright inhabits a funny place; on the one hand, he endures as one of the most popular architects, by name, in the world, and on the other hand, the architecture establishment has developed an aversion to this very legacy. As with anyone of his prolificacy there are always fans and detractors, but to his most ardent critics his works conjure an association with kitsch populism. Wright was embracing stained-glass motifs, handicraft and suburban idealism at the same time that his European contemporaries, like Le Corbusier or Adolf Loos, were espousing hyper-density and mechanization. While Loos found decoration and ornament contemptible, and Corbusier dreamed of vertical cities, Wright cultivated visions of sprawl, from the characteristically long wings, hallways and outdoor circulation corridors of his buildings to the suburban utopias he planned on the grand scale. These directions, which define Wright’s signature projects, are in opposition to all that defines sustainability in the 21st century. Thus, the paradox: the architect of the Guggenheim and Fallingwater is also the father of suburbia and rural campuses that turn their back on the city. Taliesin has often epitomized this fork in the road. Its leaders can take one of two directions: indoctrinating students in the religious mimicry of Wright’s distinctive style, or encouraging them to instead follow his spirit of exploration – by building their own shelter of residence. Over the years, previous deans have slowly eschewed the first inclination. 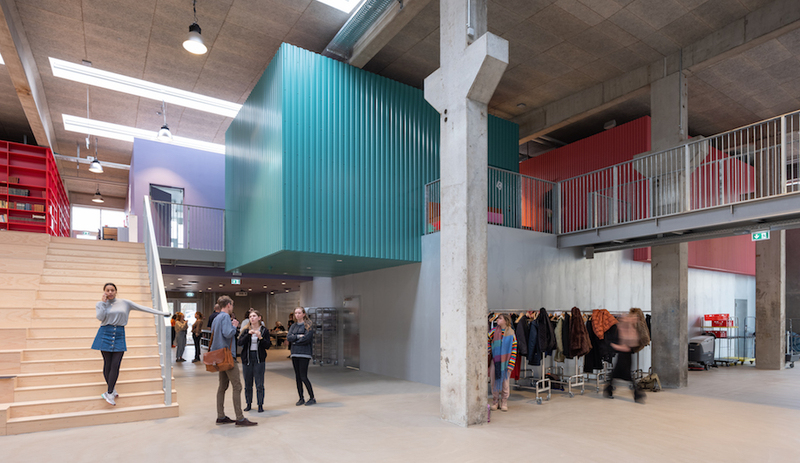 But Betsky has really sunk his teeth into the second tradition, transforming the institution into one of the best experimental architecture schools in the field. While most schools around the world teach an adherence to technology and encourage students to build upon their professors’ formalism, Betsky’s decree is cultural and critical. The core of the curriculum at Taliesin is to experiment in architecture by learning through doing on one’s own, and, more importantly, by investigating the social, environmental and cultural consequences of one’s choices through building. Betsky has also opened up the school to practicing architects to make the pilgrimage and contribute to students’ educational experience. While visiting Taliesin, I ran into Chris Lasch, a partner at Aranda/Lasch, one of the most exciting contemporary studios in the world. 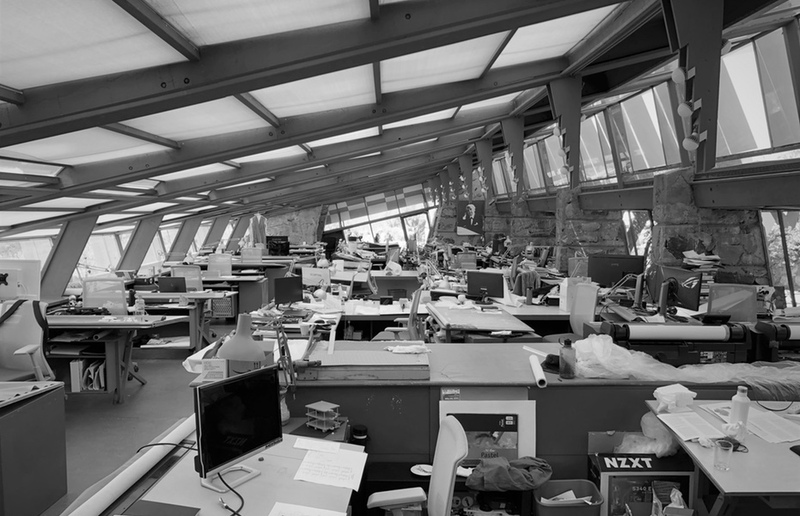 Soon after taking the helm at Taliesin, Betsky met with Lasch at the University of Arizona, where they were both participating in a series of architecture events. 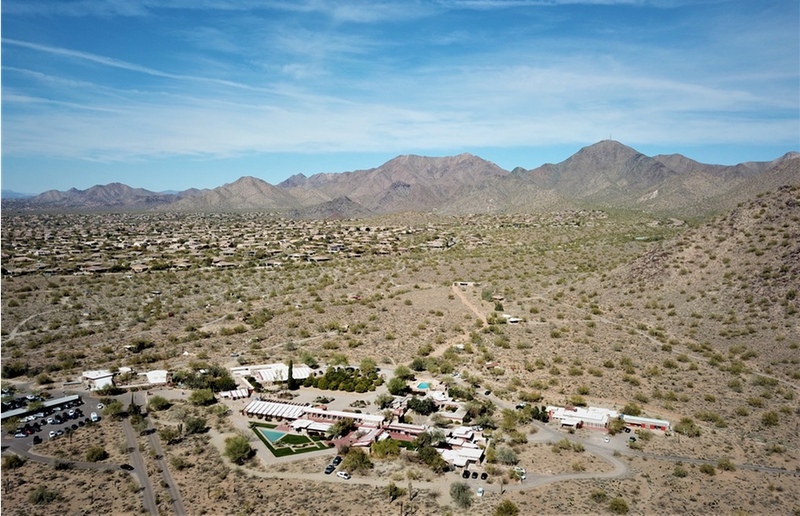 Lasch had already been spending time and working in Tucson, and so Betsky immediately brought him on to the faculty at the resurgent school. Lasch would eventually also help steer the school through a gruelling re-accreditation process. When I asked him what brought him to the school, he said that the opportunity to help Betsky to rebuild the institution at the ground level was a no-brainer. He was right: The culture and experience they are providing for students, not to mention the tens of thousands of tourists who visit the studios daily, are unparalleled. Student Richard Quittenton’s shelter at Taliesin. Upon arrival at Taliesin, each student is given the opportunity to choose a shelter to live in (there is seniority, of course) while they contemplate their move on that exact same historic canvas. Dozens of these shelters are strewn across the desert campus amongst Joshua trees and tumbleweed. Some are the original shelters built by Wright’s first pupils, some are by more recent students. 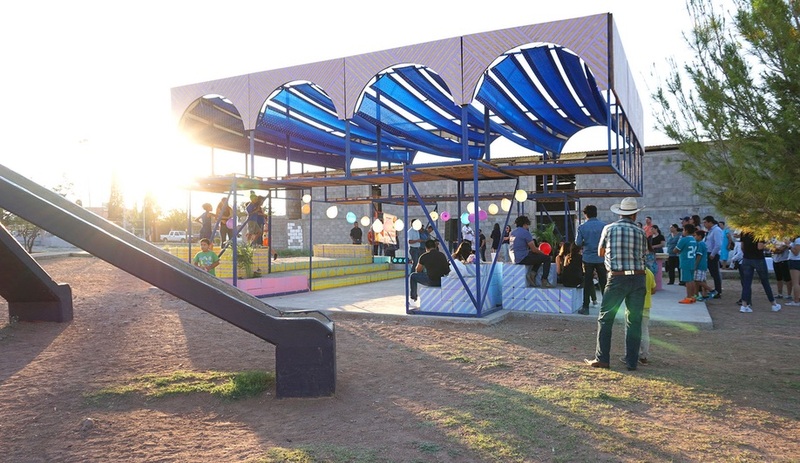 A shelter lasts only as long as the students’ interest in them. Many of the most recent residences have been very popular, but those left unselected will sometimes go to ruin – which is actually intentional and part of Betsky’s critical approach to monumentality in architecture. There is a social commitment to this precept and yet a violent reality as well: if a structure goes out of favour or doesn’t work, it simply decays. The resulting architectural Darwinism is in itself a fascinating theoretical premise. The entire project, thus, elicits the question: do the lasting effects of architecture matter at all? The point, made by Taliesin, is that once you get there as a student you live your architecture for an entire two years. 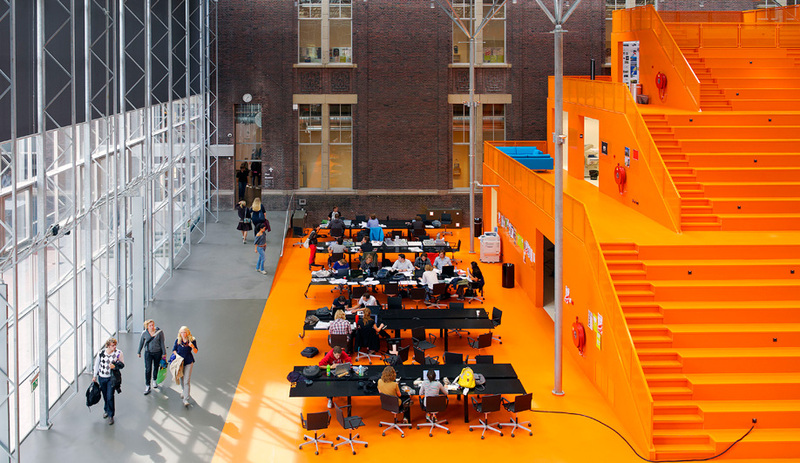 This differs from other schools because the student is confronted by a real site, a real budget (of $3,000), a real use, and the responsibility to deliver and respond, in their own way, to the current modes of design in architecture – be it computational or analog. Then, you are out in the cold desert at night with everything else that lives out there, but in the shelter of your choosing. And soon, after completing a year of school, thesis begins and you are now faced with the herculean task of contributing alongside Frank Lloyd Wright. To be clear, this is the equivalent of being offered a prestigious commission of built work before you are out of diapers! Two of the most-promising students on review that week, Richard Quittenton and Conor Denison, happen to be Canadian imports. Both were at Taliesin because they yearned for a truly extraordinary architecture education. Among the earliest recruits for Taliesin under Betsky’s new tenure, they stood out for both the craftsmanship of their shelters and their critical response to the building of them. 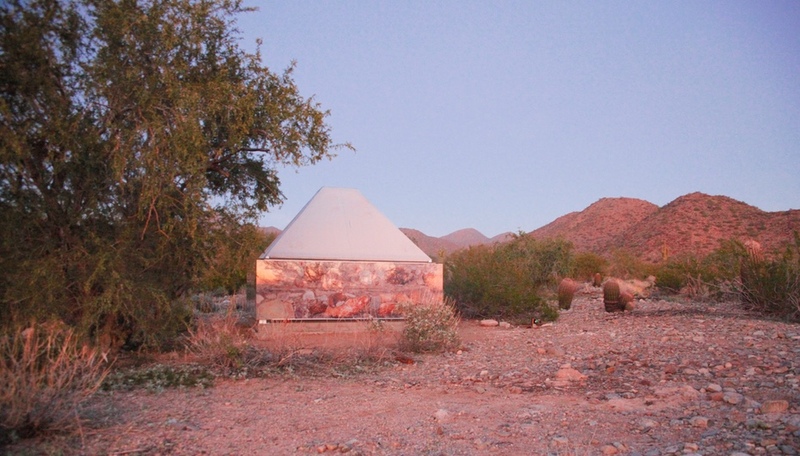 Quittenton’s project was an irreverent facsimile of the traditional shelters produced by the first pupils at Taliesin. A structure of simulation – wherein the shelter as a physical, material thing is represented as image – it reminded me of the earlier projects of Jean Nouvel that position the screen and the simulacra as central aspects of the discourse. 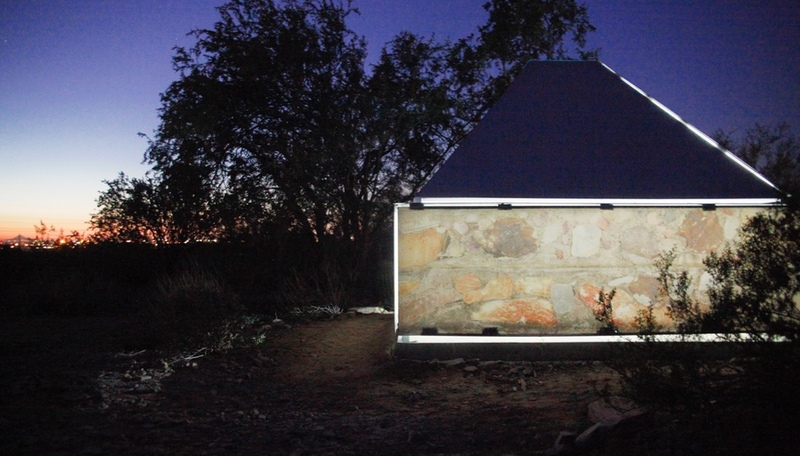 Student Conor Denison’s Taliesin shelter. Denison’s work was on the opposite spectrum, and true to the land it sits in. 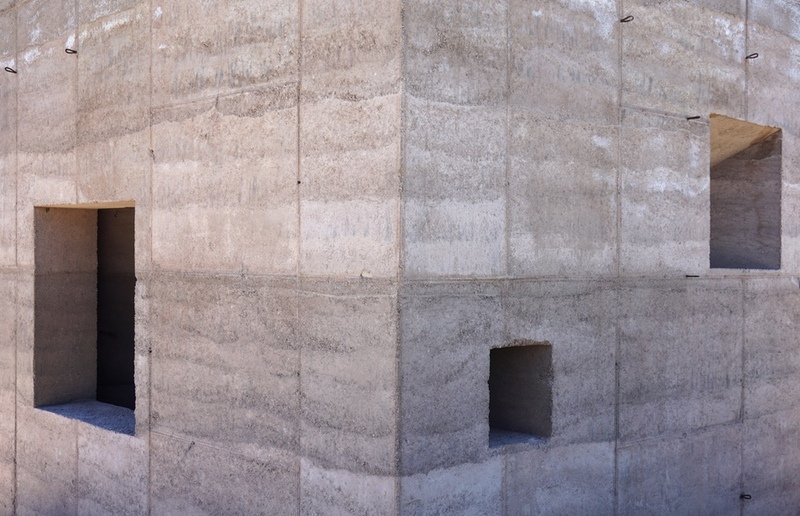 It is a temple to the ground, an ephemeral sculpture of rammed earth recycled from a local mine. In his project, there is an acceptance that we aren’t here forever. That is not a mainstream dialogue in most schools. In fact, it is quite the opposite: monumentality and materiality rule supreme. The wonderful part of this story is that both students went from suburban Toronto to working real jobs – in Quittenton’s case, at Herzog & de Meuron, while Denison is currently interviewing at Steven Holl.